Complete quizzes, watch videos and more to enter our Grand Prize drawing, and play daily for your chance to instantly win a Revlon lip. NO PURCHASE NECESSARY. A purchase will not increase your chances of winning. Promotion begins at or about 12:00 PM ET on 4/11/19 and ends at 11:59:59 PM ET on 5/31/19. Open only to legal residents of the 50 US/DC who are 18 years or older. Click Here for Official Rules, including how to enter, free method of entry instructions, odds, prize details and restrictions. Void where prohibited. Sponsor: Revlon Consumer Products Corporation. 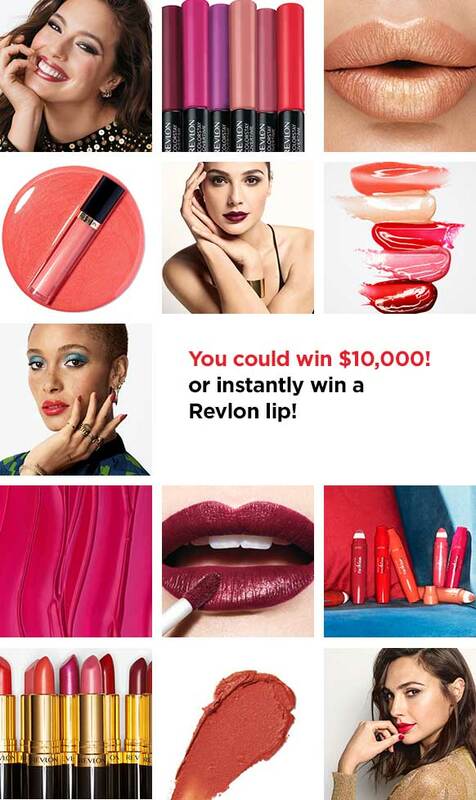 You could win $10,000 or instantly win a Revlon lip!